When I was little, one of my favorite mommy and me excursions was shopping at Nordstrom…but it wasn’t because I’d get new clothes, or my favorite Capezio dance shoes, or because I was spending time with my mom (although all of those we’re awesome) – no, I loved going to Nordstrom with my mom because she’d always buy me caramel popcorn at the cafe. It was like a ritual for me, and she was happy to oblige. Today, caramel popcorn is still a really special treat for me, and just recently, I started making it at home… which is really dangerous!! But It’s so much better than any store-bought version. Line two baking sheets with parchment and spray a rubber spatula and large bowl with cooking spray. Set aside. Heat oil in a deep pot over medium heat for 5 minutes, add kernels and cover leaving the lid a bit cracked to allow steam to escape. Kernels will pop within 8-10 minutes. Once popping is done, transfer popcorn to prepared large bowl. In a small bowl, mix cayenne pepper, baking soda, and salt. Set aside. In a medium sauce pan, combine butter, sugar and corn syrup over medium-high heat. Boil for 5-6 minutes, stirring often. Remove from heat and stir in cayenne mixture. Caramel will become bubbly, airy and light brown in color. With prepped spatula, pour caramel over popcorn, stirring to coat evenly. Divide coated popcorn between baking sheets in one even layer. Bake for 45 minutes, stirring and rotating every 15 minutes. Oh! Makes sense. Ok. I’m doing it. Hi! I feel like creating my own popcorn recipe now! Inspired! I just have a doubt though. Why bake the popcorns? Considering they are already done. Also isn’t there a possibility that the caramel coating will melt in the heat? Great question! 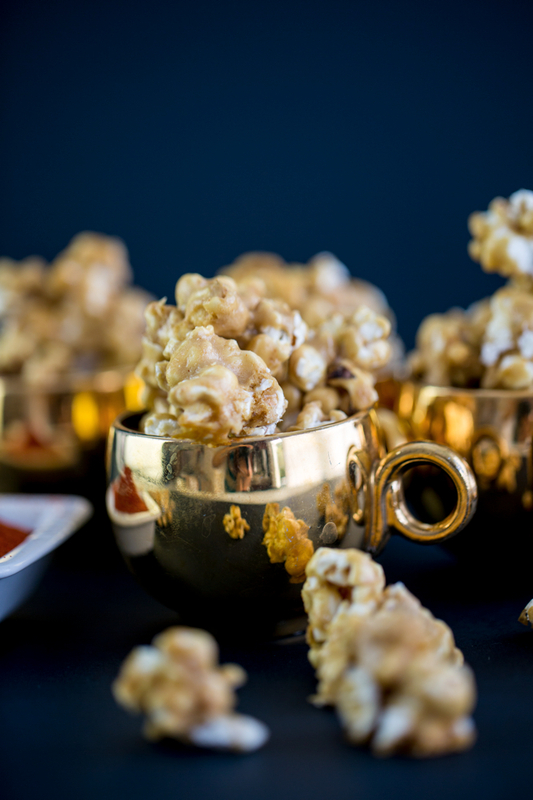 Coating popped corn with hot caramel will most likely make your popcorn a bit soggy and the caramel will remain sticky. 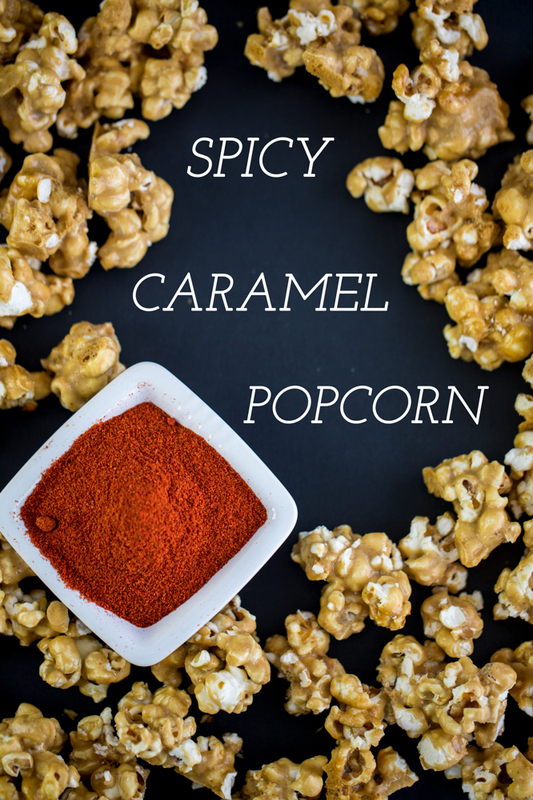 Baking at a low temp ensures that the caramel dries and the popcorn stays crunchy. If you still have doubts, I suggest baking 1 sheet according to directions, and leaving one as is to compare!! In fact, if you do this, I’d love to know the results!! Great idea! I love spicy foods. And this pairing of sweet with spicy is right up my alley. Thanks for sharing! 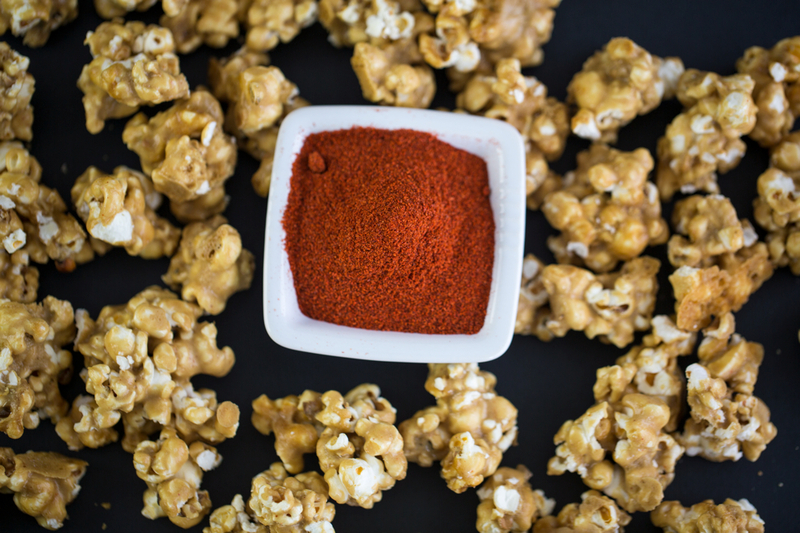 Love caramel popcorn and love your twist by using cayenne pepper! Nothing better than sweet and spicy! I’ve gotta try making this! Do you think it will work with coconut oil instead of butter(dairy allergy)??? YUM. Chocolate and chilli I can go either way on, but CARAMEL and chilli is a match made in heaven. This sounds addictilicous. This looks incredible! I’m definitely going to try this one! Thanks for sharing. Awesome! I hope you enjoy! This recipe is dangerous…fair warning! Yum! Never tried this before, I am going to make some with my daughter she will love it! I love the look of this popcorn. I just have to get good corn kernels – my last lot just burnt and didn’t pop. Grrr. Beautiful pictures too, I love the little cups. Your eye for color is just great :) And though I hate cooking, your writing and photos do make me at least want to TRY.